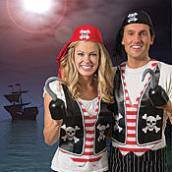 A Pirate bridal shower theme can be entertaining for guests of all ages. 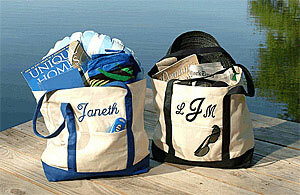 It is also a fun couples party idea. If you're questioning whether this theme is just for kids, take a look around you. You'll see the pirate influence in clothing, stationary, jewelry...just about everything. You will probably know whether your guest-of-honor will like this choice. If so, planning this party will be easy. There is so much available. Start with your own home...remember the pirates were scavengers! 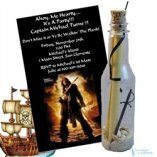 Send out a Pirate bridal shower theme invitation that announces your plans. A skull and crossbones, treasure chest, or map design will get the idea across. If you want to go all out, send them an invitation in a bottle. Let guests know if you would like them to dress up in costume. Maybe you'll just have them dress casually, and give them a bandana and eye patch when they arrive. An outdoor location works well for this theme, weather permitting. If you're outside, fill a kiddie pool with sand, and add hidden treasures. 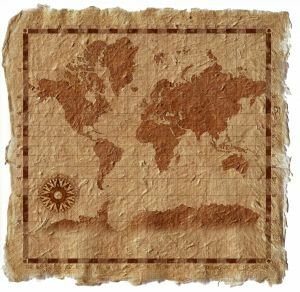 A treasure or scavenger hunt is a great idea for this theme. Get creative! • Games for your pirate theme party. • Turn a simple punch recipe for your pirate party into a special tropical drink by serving in a plastic coconut or pineapple drink cup. Of course if you're making something stronger just add "a pirate's bottle of rum". • For your dessert use a sheet cake. Decorate as a treasure map, or treasure chest. • Choose from other theme ideas. • Go from Pirate theme page, to Bridal Shower Ideas For You homepage.